Pink Paislee "Queen Bee" and a give-away! So, this is going to be a lovey-dovey drool fest!! Just as fair warning. :) By far, this was my favorite line at CHA-W. Neutral, antique, and inspiring. I could see myself using canvas, cork, felt, and so many more mediums with this line. Best part is, as a mom of a boy, I can use this to scrap pages of him and keep them manly. When I got the assignment to review the line, I squealed with joy!! The elements that struck me were the Cork Buttons that were pre-stamped with coordinating images. When I got them, they were thick and easily removed from the backing. They are not self adhesive, but that doesn't really matter. And probably my favorite element, the Ribbon Pleats. Gorgeous twill, perfectly sewn into pleats. Meaning, I do not have to take out my machine and worry about my fingers! Plus, you can cut them, without issue. 1. The color palette. Fresh and neutral. 2. Fabulous elements that coordinate without getting too matchy. 3. Completely inspiring. This made me want to scrap. 4. For my card making friends, Pink Paislee makes a 6x6 pad!!!! 1. I wish they would come out with their own cardstock-I hate surrendering a whole piece of patterned paper to get the "perfect" background color. 2. I am on the fence with their Borderlines Clear Stickers. They have a shiny finish. I did use a piece on a layout, with decent results. 3. The stamps aren't the highest quality, but I can deal with that as well. LOVE the self-adhesive chipboard letters. PERFECT amount of distressing to the edges! Oh, and one more thing to point out-this is the layout I used the Borderline Clear Stickers on-the grey strips along the top and bottom. The Punch Out Die Cuts are great-colors and shape. I tucked one underneath the right-side photo. Two more were used at the top. I also used the Cork Buttons-love the touch of midnight blue color on them. What do you think? Do you love it too? Does it make you want to run and scrap? What do you see yourself using this line for? Do you like the Ribbon Pleats too? What did you think of the Border Stickers? Share with us-we love to read your comments! Leave a comment by Midnight PST on Thursday to be entered to win the entire Queen Bee Collection!! I´m the first??? yeahhhh! Queen bee... hummm... I really like the borderlines and the die-cuts... oh! and the ribbon pleats with the bella brads look so amazing!!! And the colors of this collection... OMG, I really like it all!!! Why am I like this??? Well... you definitely can´t be selective with a collection like this... Love it!!! I love the colors in this line, muted but still colorful. The patterns are also awesome. I am with you on the cardstock opinion, I wish I didn't have to use a beautiful piece of patterned paper for backgrounds! I have been a Pink P. fan since the company started. Love their fresh and unique ideas. I love the color pallette....and the die cuts..I have some photos too that would go great with these papers.. I have to admit that at first glance those are not papers I would have been interested in. But after seeing the details that you showcased on your layouts - this line does have great potential. Thanks for sharing. Oh how I would love to win this! It is so "not my style" but for some reason, the day they gave the sneak...I've loved it ever so!!! love the ribbon pleats and the cork! it's versatile - if you don't like theprint - turn it over and use teh plain cork side. genius! I like the beautiful color scheme. I love the colors. This line is so versatile; I can imagine using it for a wide variety of projects. And I hear you about needing paper appropriate for a boy. Thanks for the chance to win! I am always so pleased with everything that comes out of Pink Paislee! I have several of their lines, but none of their newest stuff. I do plan however to get my hands on some of it. I really like this line because of the neutral colors, yellows, and vintage look. This is definitely up my alleyway! I love everything from Pink Paislee; did I say that already?! Teehee! I love your LO with the shaped paper too. Great used of die-cut paper!! I love this collection, I could see myself doing a project with these great colors, maybe a clock or a clipboard. Love it, thanks for sharing! Your little boy is a cutie pie!!! This line worked perfect for your pictures! I have been a huge fan of Rebecca's since her days of running an online store. I love the way Pink Paislee has grown and just keep getting better and better!! The ribbon pleats are one of my favorite things to come out at CHA! For me, the biggest draw about this line is that it is so unlike anything else I have, I always get bright colors with lots of flowers and bling. I am anxious to try it and would love to win!! Wow, those colors are so divine! I love how soft and delicate, yet very modern. Your layout turned out way cute! I'm totally with you on the cardstock thing ... I love having perfectly matching solids, and I hate giving up a whole sheet of pattern. I'll usually end up buying extra sheets just to get the solids. This is beautiful! Looks great with baby pics. I think it would work great with pictures I have of my grandparents and childhood photos of my parents! I love the colors in this line. That alone would draw me to it in a store. I like that they make the 6x6 pad of paper also. I love the versatility of this line! It's a very different colour scheme than I would usually pick...but I like it! Love the die cut paper and the flip notes. I've been eyeing this line since I saw the sneaks. I also have a boy and his Kinder class is called "the Bee's" (teacher's last name starts with B) & they decorate in Bee stuff, so this will be PERFECT to do some layouts of photos from his classroom (& with teacher/classmates). That cork & the alphas look amazing. Love your layouts!!! I really live the color combination. Thanks for the chance to win. When I first saw the new lines, I wasn't as drawn to the colours in this one because they are so neutral. But I really like it now that I've seen some layouts done with it. It's subtle but the detailed cutouts etc still pop. The ribbon pleats in all the new PP lines are great since I don't have a sewing machine. Thanks for the chance to win! You did a great job with this line! I love the grey colors that is my fav color right now!!! Love Pink Paislee anything! And this line is fantastic! I love it and I love what you did with it! Beautiful! I am so loving yellows lately and this soft color palette is absolutely perfect! Beautiful layouts! Love the colors. Thanks!!!! Beautiful creations! Love the unique items that they offer for embellishments in this line. I would likely scrap heritage photos with this line. Lovely subtle colors that are sure to go with all types of older photos. I've never seen it in person but I'm dying to get my hands on it. It's just awesome! This one is my fav from their last release and it is just gorgeous!! I hope to get my hands on some real soon! The ribbon pleats and border stickers are so amazing! Love those products! And my fav thing about this line is that it is so versatile! I could use it for so many things! :D Thanks so much for the chance to win some! YaY! oh wow, wow, WOW! love what you did here Kimberly!!! Love me some Pink Paislee!!! I love your l/o's Kimberly. They compliment the product perfectly! Gorgeous colors and love the pleated ribbon. such beautiful layouts, I know this was a sought after line! I love Queen Bee, think the color palette is something different what I've seen before. When I first saw it, I doubted that I could ever find anything to scrap with those colors, but after seeing DT projects over at Pink Paislee, and other places, I've got lots of ideas! as a lover of earth tones, I can see myself using it all since I have 1 of each boy & girl. I'd venture out the norm and do all our pumpkin patch LO's with this line. The color combo is fresh and lovely indeed! Some of the embellies caught my eye too - Bella Brads for instance. And I love this old-time feel this line has. I absolutely love this line. I have two boys and it's so hard to find a line that is antique/vintage and that I use to scrap some of their candid pictures. Pink Paislee is by far my favorite manufacturer and I absolutely love this queen bee line! 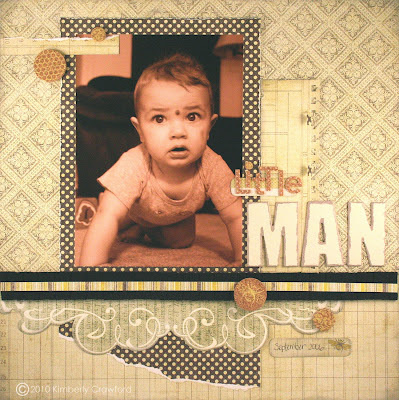 I agree that it is great for boy layouts (i love your last layout) and I see it being used for heritage layouts also. I would LOVE to be able to add this collection to my stash! oh, and don't be afraid of the border stickers-they really are great once you start using them regularly. I love the colors in this line. The pleated ribbon is genius, and the cork accents are beautiful and trendy! Love the neutral colors and all those yummy shaped papers. I would like to win these papers. It's very beautiful. Wow these papers are gorgeous and those colours are devine!! Great sample pages and I absolutely LOVE this new line from Pink Paislee!!! So very pretty and colorful without being overwhelming!! the ribbon pleats and cork buttons caught my interest when these were first previewed. It would be fun to win this!! I love you examples!! thanks for another great review!! First, adorable LO's... Great inspirations!! I really like the colors that were used in this line. The flip notes are cute and I like the cork buttons too. The pleated ribbon is great, would save lots of time.. I am in love with the pleated ribbon. I love your LOs. Great job! Not my usual style of product, but I love what you've done with it, and there are definitely some intriguing (sp?) elements I would love to try and use. You've convinced me! I just love the muted tones in this line, I hope my LSS gets this line in ASAP. I have wanted to use the pleated ribbons since I seen the CHA vids. I have my fingers crossed! This line is simply gorgeous! And your layouts are beautiful! Thank you for the opportunity to win the entire line- WOW! Loving all this. Funny cause I'm usually not a fan of "antique" stuff but loving the scallops and colors. Yes I will run out & get it if I don't win it and scrap even a mini! The line is appealing to me. I know which photo's to scrap with this line! I Should like to win it! This is a very beautiful line. Your layouts are amazing. Thanks for the chance to win! As a mother of 4 boys, this line is perfect, I love the grey/yellow/black together. LOVE your creations with this line. Pink Paislee is my favorite scrapbook company and this is my FAVORITE line of the new CHA Releases!! Honestly, I adore the color combination of yellow & gray (I wear it a lot too). I love it and can not wait to get it! i love your layouts and the colour of the collection is just gorgeous !! I adore the entire paper line. LOVE the colors and yes it makes me want to scrap something right away. After looking through the paper I must have it as I know the layout I will make out of it. You know how you have something in mind but just can't find the right paper?? Well I just did! I would love to win as I keep looking at this collection and I'm loving the colour's and ribbon and the stamps look really cute as well I just don't seem to find it in the UK at the moment !!! This line is GORGEOUS! It does make me want to run to my scraptable right now! I am in love with those ribbon pleats and I can't wait to get my hands on this line! I just love anything Pink Paislee! I can't get enought of it and the new lines are to die for!! Absolutely love those pleated ribbons and the color combos in the Queen bee line are gorgeous and so versatile!! Your layouts really did that line justice, they are beautiful! I really like the embellishments they have added to their line- I am looking forward to trying some of the pleated ribbon. I love the layouts you made with this line. I love this collection! The patterns are gorgeous and I would LOVE to try that pleated ribbon. Thanks for a chance to win! Absolutely stunning pages Kimberly! I adore this line. The colours are feminine but work for masculine pages and I would love to add this to my scrappy stash! I love this line! It is so versatile-it could look masculine or feminine depending on what you do with it. Pink Paislee is one of my favorite companies! I love the pleated ribbon!! Thanks for the chance. wow, you've done some BEAUTIFUL things with this line, Kim! i, too, am always looking for things to scrap my son (who's nearly 17 now)... the gorgeous neutrals in this line would be PERFECT (as you've demonstrated!)... i'm particularly intrigued by the pleated ribbon, cork buttons, and BIG PATTERNED PAPERS, as i am a fussycutting fiend! LOVE that technique! beautiful line, and your pages turned out brilliantly. THANK YOU, too, for letting us card makers know about the 6x6! WOO HOO! OOooh, these are sorta muted colors and I love them! Thanks for the chance! What beautiful projects you made with this collection! I'm in love with the ribbon pleats and cork buttons. Anything with texture is right up my alley! Oh, so pretty! I love the colors! Works for girls and boys! super cute projects! Love the ribbon pleats and how cool are the buttons!!! LOVE them! I also like the colors--not bright...dull...love it! Oh - it makes my head BUZZ and my heart ZIP ABOUT - how beautiful - I want to make cards non stop and scrap my heart out, its so adaptable - the colors, the patterns, the gorgeous accessories. Well Done Pink Paislee again. I think these layouts are gorgeous, OMG, LOVE the last one! So precious and the design is awesome! I don't have access to this line anywhere local so this would be awesome. Thanks for the chance to win! I think this line is actually not all that bad, there are a few things that I can create with the different shades of green - paper flowers, etc., I like the idea of using this line for cards for a man as they are not my usual bright, fun and festive colors! I'm not sure my computer screen does the colors justice. This is one of those lines I think I'd have to put my hands on before deciding. I do love what you did with it and think it might be good for vintage photos. OH I LOVE the die-cuts and the ribbon pleats would be a definite to try!! Great lo's....Pink Paislee does it again!! I recently received some of the pleated twill as part of a kit club I subscribe to. I LOVE, LOVE, LOVE it. Pink Paislee is the best! I adore this line! It's a nice fresh look to someone who normally goes towards bright colours. This would be perfect to scrap some quiet moments that have been captured over the years. I seem to be in the mood for anything 'royal'. Love the pleats and the die cuts. I'd love to win this set!! I just love the colors so much!! It's my favorite color and they are so muted and dreamY! I absolutely love the muted colors this collection offers and can see myself using it for . . . well, everything really! 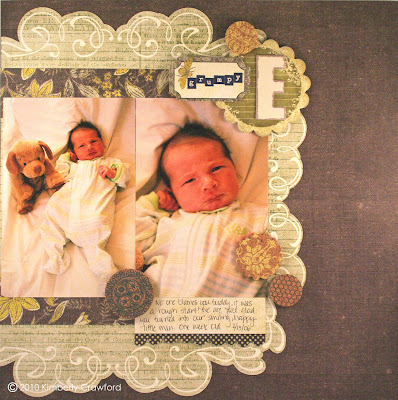 I agree with you that the pleaded ribbon is so beautiful and I just love your layouts! What a beautiful collection! Just love the muted hues of this, & the cutout papers/labels! I love the line. The colors are just fantastic. Love it. Your layouts are beautiful. I LOVE this collection. I have been waiting and waiting for it to show up at my LSS, they're supposed to get it, but they still haven't! :( The line is just gorgeous, I also love the large patterns, I would be busy with my scissors! And I love the pleated ribbon and cork elements, too... and the color scheme, I just love it all! Oh this is just gorgeous!! Its making my head spin just thinking about having to choose a favourite item, just looove the pleats and the brads, the colours are just DELISH!!!! OK I will be the first to admit, when I saw this line I did NOT like it at all, BUT in all honesty, now that I see your layouts..I really do like it! Wow super cute! maybe I will try to find some, wish my local LSS would quit being stubborn and carry Pink Paislee! Wow! I love this line and the colors! The whole collection is beautiful and I have several layouts I would love to complete. I love the ribbon pleats and the cork buttons the best! also i like the neutral colors in this line. it would be perfect for so many different occasions. thanks for the chance to win the collection. Love, love, love this line! the colors are fabulous! and yes, I love the pleating! I'm too lazy to try it on my own! LOL! I love the fact that it's already done for me! Thanks so much for a chance at winning this awesome line! I love, love, love this line! The colors, the pleated ribbon and the flip notes. I can hardly wait to see it in real life. I was just admiring this product line this morning! Would love to have this very unique collection of patterned papers. I fell in love with PP's other lines from CHA, but hadn't really considered ordering this line. After seeing your layouts, I may have to order this one too! Love the cork buttons and pleated ribbon! Love a collection that works for the masculine crowd! Great reveiw, Kimberly! I think I need to see this line in person. The colors seem off? The layouts are beautiful, for sure. The green tones almost seem too much when I look at the collection as a whole online. However, some of those embelishments are totally fabulous and unique!! I love it all for the muted, palette and classic designs. If I had to pick one fave, though, it would be the distressed chipboard alphas. I must have them all!!! I am lovin those pleated ribbons, they are heaven sent!!! I adore this line! The colors are so awesome and inspiring. I would use it to scrap my nephew, my pug, me, Idec coffee - everything!! I also NEED the pleated ribbon - wow - it is awesome. Thanks for a chance to win it and I love your projects!! It is a beautiful line - loving the wonderful colors and the die cut paper. This line would be perfect to use when scrapping my boys! Yeah! I LOVE that pleated twill! It is hard to pleat ribbon neatly and accurately which is why I usually go for the messy and whimsically uneven look! This would be a great product to have! I love this line!! As a mom of a little boy, I get so sick of blues and reds for his pages. This is a nice change from the ordinary. Hope I win!! Ohh, so nice! I love the line! I'd prolly use it for some of my boys pics, and we're renovating our home and I'm looking for a line to do my mini album! Oooh la la!!! So nice indeed. Loving the die cut paper and punch outs, oh and that pretty pleated ribbon. Divine!!! This Kit is beautiful!! I Love the colores and the LOs the ladies did with this kit are so wonderful! I seriously love the color combo in this collection and the pleats are amazing! I love the pattern papers and the color palette. Beautiful. Ribbon pleats sound great too. Thanks for a chance to win. The colors are pure bliss. I love the varied tetures too. All around great line. I REALLY like your layouts...and the paper responded to your creativity. Thanks for the insight...I really needed that!!! I can't see much of the detail from the picture. The colors appear a bit drab to me. This would not be something that I would buy. It is hard to tell from the photo if I would like the colors. Sometimes things look different in person. I prefer brighter colors for my scrap layouts, but might use this for cards. I am a little concerned that you said the stamp quality is not good, I have used stamps like that and I find them frustrating. All in all, I would have to see it before I could decide. Kimberly, I love your review and you're right - those papers are awesome! It's not a color palette I use a lot of, but I really like the look and patterns in the collection. I've been wanting to scrap with these colors for awhile now, but was intimidated by finding the right shades to fit together. Pink Paislee did it for me! I'd love to win it. i love the colors. i am all about the distress and vintage look. i hope i win this. Fabulous line!! I actually LOVE all three lines they released--beautiful papers & embellishments. I am totally in love with the Artisan Elements & Canvas Albums. Can't wait to get these & play with them!! Wow, this is a beautiful line!! now I really just want to run home and scrap! I have a boy and a girl and I would see myself using these papers to do pages for both, but I think I would rather want to use them for my boy. love the tender colors of this new line !!! I love this line so so much, hope i'll win ! Your projects are beautiful! O love the colors in this collection as well as those cork embellishments! It's a gorgeous collection and the colours are perfect for springtime photos. Would love to win a collection so keeping my fingers crossed. Wow, Queen Bee looks gorgeous, perfect for St. Paddy's day and anything garden related! Sure could use some of that! I looked at the collection and thought yeah I like that it's OK, then I looked at the LO's and was WOW! I am now thinking I don't like it anymore.....I LOVE IT!!! A definate must have in my opinion! Those ribbon pleats are gorgeous and I defo have to have them and the little pad too what a wonderful shape! Oooo am too excited now! I love the colors of this collection! Can't wait to see it in person! I love it - it lends itself to many categories! 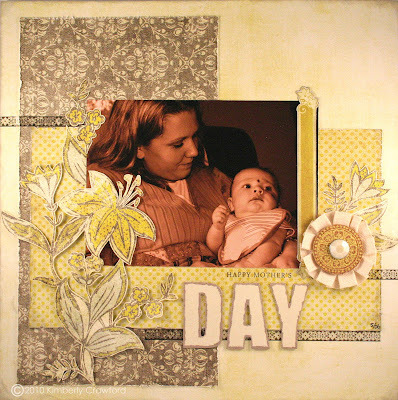 Fresh & Funky or you can go Vintage - I see cards, layouts, collages many many uses...Great review & I love how you used the collection! the collection is beautiful. the papers are my favorite, i can see using this for spring photos and it could either be very formal or just fun. love the pleats! they are just perfect! I really like the color combination in this collection, the cork embellishments are awesome, and I LOVE the pleated ribbon. The minute I saw this collection I knew exactly the pages I would do...I hope I win this collection, thanks for the chance. Wow love your work and the line is beautiful. How you made that flower with the pleats is gorgeous. It is beautiful but can still be put on a boy page! I would love to win it! In no way am I an expert, but this line looks great. Great job showing it off Kim. I would love to give it a try. The collection can be used in many different occasion which is so appreciated. Love that they have different texture in their embellishment. The pleated ribbons is a FAB idea for those who want something different in a trim (coughMEcough). I love Pink Paislee and this line is no exception. It looks magnificent. I think the cork buttons are my favorite. Thanks for the chance to win! I love the colors and the idea of cork buttons can't wait to try. Love your layouts! thanks for sharing! I love how the colors are muted just enough. Can't wait to get my hands on it!!!! Those borderlines look very interesting, I may have to give those a try. I like the already pleated ribbons as well, I can see lots of uses for that. Great layout!! I love this line, and love this company. The product is fresh and gorgeous. I love the colors, they flow so nicely. The die-cuts look like a lot of fun too! Kimberly, you lo are amazing, you have such great style. this is the best Pink Paisley ever!! I love it! Okay Ms. Kimberly....after I saw your JustRiteMegaBlogHop card with these papers, I decided I MUST have them! Ribbon pleats? Cork buttons! Oh, be still my heart!!!! Perfect colors and great embellishments to add to them! I am excited and would love the cance to win. If I do not then I will definitely go out and purchase it! a great versatile collection for many uses. I have wanted this line since the CHA peeks. This is a beautiful line and can't wait to get some! thanks for a chance to win. Love the colors. The cork buttons are too cute! This line is so beautiful. I love the paper, the muted colors and embellishments. I would make a minibook for a special girlfriend. It would be of our last visit together. The stamps would be perfect. How cool to have a crown and bee stamp. I've seen this line around and I really think I like it a lot :) I especially LOVE the cork buttons! Would love to win the collection, but if I don't I think I'll have to pick up the 6x6 pad and the cork buttons! I really love the color combo and designs of the pattern paper. My favorite embellie is the ribbon pleat and the cork button. LOVE your layouts. Can't wait to see this in person. I just love the color palette here...so soft and vintagey. The pleated ribbon is gorgeous, the cork buttons add a great touch of texture. I can see myself using these to make awesome altered books. I love the cork buttons!! And I have to say that I am just in love with the paper. It is bold but soft in some strange way. I just can't describe it but it's FABulous! Thanks for a great review and entire collection give-away!! I'm not sure about this colors, but the cork embellishments and pleated ribbon are gorgeous! Beautifuly layouts! i love this line!!!! i have it pre ordered, can not wait to get it!!!!! Absolutely loving this line... you had me at "cork"!! This set is wonderfu. I love that it can be used on masculine and feminine paper. 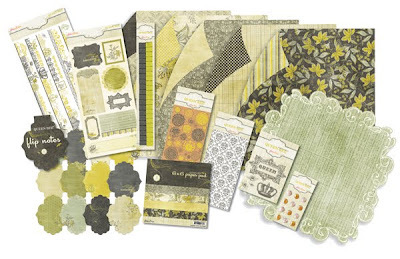 A beginner or advance crafters would be able to create something wonderful with this Honey Bee collections. The pages you created are just beautiful. Thanks for sharing them with us. Miss Kimberly did a wonderful job. Really love this collection. The colors and unusual elements of cork, pleated ribbons really appeal to me as I like to use things out of the norm. The vintage inspired colors are wonderful for any style of decor. I like that. If I make a layout of a friend I could trust it could go with her home. YES, it inspired me and I want to go a scrapping right away. I like this line of products - I like that it's so neutral and isn't too wild - it makes it so much more versatile! I also love the different/unique textures that it has! not sure either.... I think I would have to have it in front of me and play with it first. I love how neutral this is, and that it uses lots of gray! Just love those muted shades - perfect for all kinds of layouts. Wow I love it all.I can't wait for it to hit our New Zealand shore.The ribbon is very awesome. Just a hint of spring. I love the muted colours.. just beautiful.. lots of ways to tie those papers into cards and layouts! Kim, I too love the ribbon pleated twill. The layouts of little man are great! This collection would be great for me to make layouts of my sons. Thanks for sharing your review. God bless! The hues of this line are delightful. This collection looks fabulous! I totally agree with you though, it would be nice if they had their own card stock to match! I love this collection! Hope I win! The collection is gorgeous!! Very classy. Great layouts Kim.